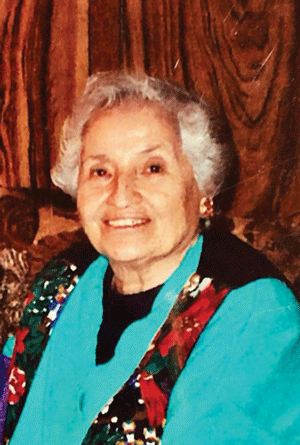 Theresa H. Ruiz, a lifelong resident of Lindsay, entered into eternal peace on March 24, 2019. She was 92 years old. Theresa was married to husband Ernest L. Ruiz for 67 years. He preceded her in death March 14, 2015. She was a loving mother, grandmother and great grandmother. She was a member of the Lindsay Sacred Heart Catholic Church. Theresa worked at the Lindsay Hospital for 25 years as a nurse’s aide. She is survived by two sons, Ernest Ruiz Jr. and Russell Ruiz as well as his wife Carlene; a daughter, Rebecca and her husband John; a grandson, Ernest Ruiz III; three granddaughters, Nicole Howard-Ruiz, Erika Martinez, and Shiri See; as well as seven great-grandchildren. Theresa was preceded in death by her grandson Zachary Ruiz on Jan. 13, 2016. Private services were held on Friday, March 29, 2019 at the Lindsay Strathmore Public Cemetery in Lindsay. Condolences may be sent to the family at www.webbsandersandsmithfh.com.